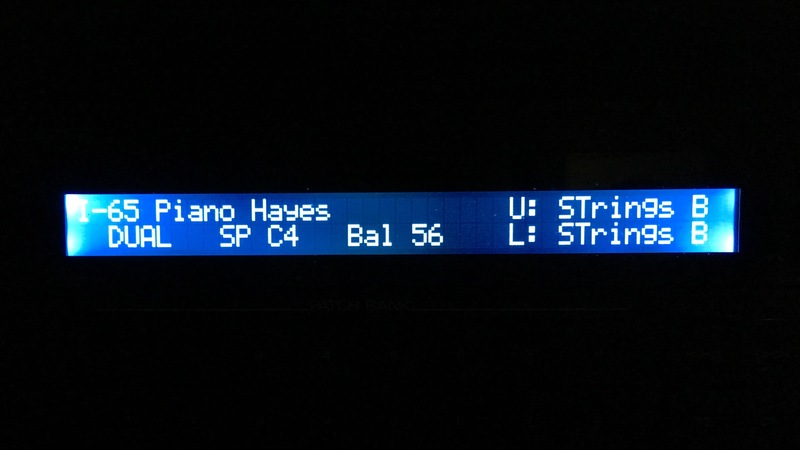 The EL backlight behind the LCD on my D-550 was dead. It was dead when I received it off of eBay, and it was probably dead in while in the studio of Issac Hayes (apparently, that’s where my D-550 came from). Becoming fed up with using it with a keychain flashlight and not wanting to install another short lifespan EL panel, I decided to do something about it. Scouring the internet I found a great set of hacking instructions over at slashdirt.org to swap out the whole panel for an LED one. Mindful of the maximum current draw of 175mA, I located a 30mA 40×2 white-on-black LCD at buydisplay.com. A few weeks later it arrived and after following the Slashdirt directions to the letter, I now have a glow-in-the-dark Roland D-550 again, albeit with an updated white-on-black display. After examining the old LCD unit, it looked like the EL panel had been replaced at least once, which makes me think the little D-550 did spend its life in someone’s professional studio. Maybe the Issac Hayes part is true — the Hayes Piano sound the came with it does sound a bit funky familiar.